Describe a public leader. What image pops into your head? For many that image would be a white male. Teach a Girl to Lead™ provides the tools and resources to help young people rethink leadership and refocus the picture, because if a girl can’t imagine a woman leader, how can she become one? And if a boy sees only men in leadership roles, what will convince him to support aspiring women leaders? The Center for American Women and Politics (CAWP) created this project to inspire girls and young women to follow in the footsteps of women leaders, past and present. Making women’s political leadership visible to America’s youth will help both boys and girls grow up with more inclusive ideas about who can lead. We offer a gender lens – a fresh way of looking at public leadership that asks where women are and have been, where they have been absent by design or by custom, and how we can reframe our ideas about who leads. Teach a Girl to Lead™ is designed for educators, leaders of youth-serving groups, media outlets that target young audiences, and parents, the first and most effective teachers. Tools for examining leaders and leadership through a gender lens. In 2013, The White House Conference on Girls’ Leadership and Civic Education was convened by the White House, the U.S. Department of Education, and CAWP. 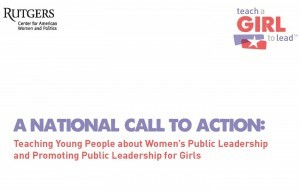 A National Call to Action: Teaching Young People about Women’s Public Leadership and Promoting Public Leadership for Girls is CAWP’s report of that conference and its outcomes. We hope it will serve as a blueprint for guiding educational initiatives, programming, and other interventions in the field of girls’ leadership and civic education.